B-TEK Endurance-AT was developed by leveraging years of experience in truck scale design, innovation and fabrication. The Endurance-AT balances the need for weighbridge strength coupled with superior quality load cells and overall affordability. The Endurance-AT is a perfect fit for commercial manufacturing, light industrial and seasonal farming applications. The B-TEK name has long been synonymous with extremely well built truck scale products designed to provide many years of dependable, trouble free service. B-TEK is devoted to offering a complete line of truck scales to meet any application requirement, from a new installation to a precise fitting retrofit of an existing concrete foundation. Decades of application experience ensures B-TEK truly understands customer truck weighing challenges and is able to deliver a scale solution. The Endurance-AT was developed by leveraging decades of experience in truck scale design, innovation and fabrication. The Endurance-AT balances the need for weighbridge strength coupled with superior quality load cells and overall affordability. 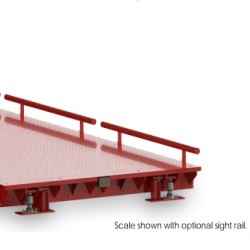 The time proven bridge-beam design weighbridge features 12" tall WF-beams spaced tightly for strength under load. All beams and plates are thoroughly cleaned by centrifugal shot blast equipment prior to receiving a two-coat, epoxy and polyurethane paint system. The hermetically sealed, stainless steel compression column load cells are impervious to outdoor elements and provide complete protection from surge voltage and lightning. Concentrated Load capacity: 70,000 lbs. Scale Dimensions: 69' 10-1/2" x 10' 10-1/2"
Not sure which B-Tek Truck Scale is right for you? Take a look at our comparison chart below to decide what item is best suited for your weighing needs.